I’m sorry to unleash my biggest Pet Peeve on you but I just can’t take it any longer. Ignorance may be bliss for a pet parent but lack of knowledge about what your pet should and should not be eating is anything but bliss for your dog or cat. When it comes to pets, I have three hot buttons that take all of my restraint not to voice my opinion when I encounter them.Two of the three have to do with food (the non-food vexation is flexi-leads but I’ll save that for another day). 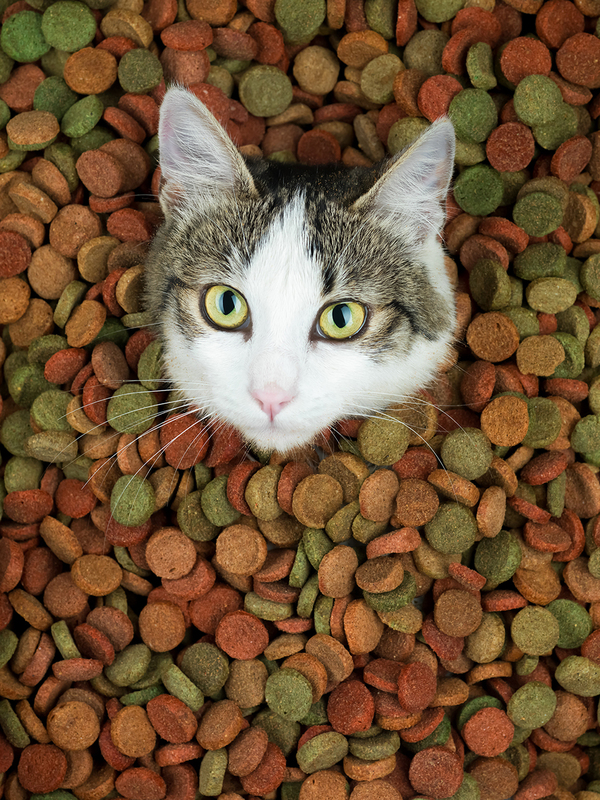 The big two are overfeeding (or over-treating) and not having basic knowledge about what main ingredients should be in your pet’s food. It just takes a few minutes to learn and you can make a huge difference in your pet’s health over the course of their lifetime.First, if your pet is overweight, it’s your fault. Killing them with food does not a good pet parent make. Keep them at a healthy weight and they will love you for more years. Next, learn to read a pet food label. Ingredients are listed in order of quantity so the first five ingredients are key. The first ingredient should be a QUALITY protein source and preferably the second ingredient as well. Quality means a whole source of protein like beef, chicken, salmon, bison, etc., not poor quality sources such as poultry by-products or meat by-products. If the first ingredient is a grain, like corn, put that bag back on the shelf as fast as you can.Corn is usually the number one ingredient in poor quality food. It’s a filler with no nutritional qualities. As for grains, look for whole, unprocessed grains such as barley, oats and brown rice; vegetables are a good thing.Avoid brewers rice, corn gluten meal, etc. There are entire books written on pet nutrition but this quick version of what to look for in dog food should get you on the right path. I know people that are crazy about their pet and then proceed to give them a Greenie or two per day and purchase the lowest grade of food on the shelf (Greenies are ok but in moderation).They simply haven’t taken the time to learn about their pet’s nutritional health. I had no plans to write this “soap box” but while I was looking for something on the Internet related to Father’s Day for pet owners, I found a pet food called Dad’s. Ground Yellow Corn, Soybean Meal, Beef Meal, Animal Fat (Preserved with Mixed Tocopherols), Corn Gluten Meal, Chicken By-Product Meal, Natural Flavor, Salt, Dried Beet Pulp, Dicalcium Phosphate, Iron Oxide, Choline Chloride, Vitamin E Supplement, Zinc Sulfate, Ferrous Sulfate, L-Ascorbyl-2-Polyphosphate (Source of Vitamin C), Niacin, Manganese Sulfate, Copper Sulfate, D-Calcium Pantothenate, Biotin, Sodium Selenite, Vitamin A Supplement, Riboflavin Supplement, Vitamin D3 Supplement, Thiamine Mononitrate, Pyridoxine Hydrochloride, Menandione Sodium Bisulfate Complex (Source of Vitamin K Activity), Vitamin B12 Supplement, Potassium Iodide, Cobalt Sulfate, Folic Acid. Now, with your new found knowledge, you know to focus on approximately the first five ingredients to determine quality.When in doubt, visit a retailer that has knowledgable employees who have a good understanding of the many brands on the market. Some are specialty products (for puppies, small breeds, allergies, senior, etc.) and an informed sales person can help you figure out what is best for your pet.The retailers and pet resorts that advertise in Houston PetTalk are all about quality from training to boarding to nutrition and many of them carry quality foods. If you are looking for both the convenience of home delivery and knowledge, try a locally owned business, www.allnaturalpetdelivery.com. It just takes a little extra effort and maybe a few more dollars but the quality of your pet’s life, the longevity of their life, the amount of waste they produce and the potential decrease in veterinary visits will make the effort worth it. To learn more, there are a few good sites to visit: www.feedmypet.com or www.wholedog- journal.com.